Christmas in the Park is a favorite holiday tradition in Kansas City, Missouri. Every year, 300,000 lights, 175 animated figures, and splashes of Christmas color turn the campground at Longview Lake into a winter wonderland. The entire family will revel in the magic of this enchanting drive-thru light display and fund-raiser. More than 2 million local residents have driven through the annual Christmas lights event since it began in 1987. A companion event called Christmas in the Sky was added in 1997 to kick off the annual Christmas lights display with a stage show and fireworks. Both events have become holiday favorites in Jackson County, where Kansas City is located. County officials organize both events every year, and local radio station 99.7 The Point provides the fireworks musical soundtrack in a simulcast. Christmas in The Park is open every night from the Friday after Thanksgiving through December 31 at Kansas City's Longview Lake Park, located two miles south of I-470 off of View High Drive. The two-mile to Christmas In The Park drive begins at the Frank White, Jr., Softball Complex, 3901 SW Longview Park Drive. Christmas in the Park is open nightly through New Year's Eve. Hours are Sundays through Thursdays, 5:30 p.m. - 10:00 p.m. and Fridays and Saturdays, 5:30 p.m. - 11:00 p.m.
Christmas in The Sky is a kick-off event, held at Longview Lake Beach, preceding Christmas in the Park. It includes celebrity performances and an evening holiday stage show with scores of singers and dancers. Santa arrives on a mule-drawn sleigh with The First Gift of Christmas. Then tremendous arrays of colorful fireworks, synchronized to holiday music on 99.7 The Point, light up the skies over Longview Lake. After Christmas in the Sky, Kansas Citians have their first chance to travel through the park by car or bicycle to see more than the 300,000 lights and 175 animated displays that make up Christmas in the Park. Every year, the county's Parks and Recreation department adds a new display to the experience. Gates open at 5 p.m. and the holiday stage show starts at 6 p.m., followed by fireworks at 7:30 p.m. Admission is free to both the Christmas in the Sky holiday stage and fireworks kick-off shows and the Christmas in the Park holiday lights display. But donations are accepted, and a portion of the proceeds is divided among 35 Kansas City area charities. Be sure to have plenty of gas and plenty of time at your disposal. You should expect bumper-to-bumper or slow-moving traffic getting into the park, driving through it and leaving it. So a weekend trip through the park displays could take a few hours. Also, make sure that you drive with your parking lights on so that you don't annoy the people in front of you. Kansas City goes all out for the holidays. 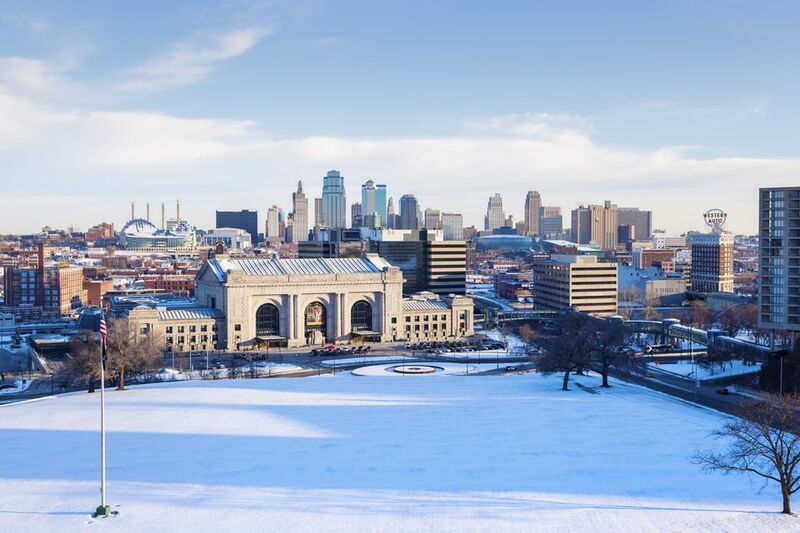 From the famed Plaza Lights display and abundant holiday shopping opportunities to ice skating, New Year's Eve celebrations, and metro-wide seasonal home decorations, Kansas City is full of family-friendly diversions.